Making cocktails with tea is tricky as the brew continues infusing, even once the leaves are removed and if not used immediately, can become bitter and woody. This is particularly apparent when using a strong, black tea such as Assam, but making a syrup or fruit concentrate, can avoid the problem and if refrigerated, will last for a week or so. The rich, malty flavour of golden tip assam is particularly suited to a peach concentrate and will combine with most spirits to make delicious tea based cocktails. It was originally conceived as an integral part of the Tease Maid Cocktail, a delicious blend of Rumbullion spiced rum and Assam Peach Concentrate, that was created for Sarah Allard, to encapsulate her vision for an exclusive Tea Lounge. Initially I made this using fresh peaches which I blanched, skinned and de-stoned, but after trying it made with canned peaches in juice, rather than syrup, I can testify that it tastes just as good. 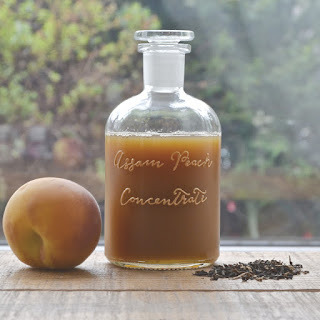 So, unless you have an enormous surfeit of peaches to use up, save yourself the trouble and buy a good quality can or bottle of peach halves in juice. The tea should be a high quality, loose, golden tip assam such as Jing Assam Gold; the flavour is characteristically malty with notes of fruit and spice. Jing Tea stock great teas from the best producers, across the world. They supply luxury hotels and top restaurants across 75 countries worldwide. I fell in love with their teas after tasting their Organic Bohea Lapsang Supreme at Asia de Cuba in London and have been treating myself ever since. Using a blender, purée the drained peaches and set aside in a bowl, sprinkled over with the white sugar. If possible, make a little sachet to hold the tea, using a scrap of muslin cloth, ensuring it is securely tied so that it remains tightly shut when the water is poured over. Using 500ml just boiled water, pour over the sachet and allow to steep for two and half minutes. Remove the sachet, taking care not to burn your fingers and squeeze to extract all the tea. Pour the still, hot tea over the purée and stir until all of the sugar has dissolved. Cover with a muslin cloth until cooled, then transfer o an airtight container and refrigerate for 24 hours. Using the muslin cloth, strain the mixture into a clear receptacle, ensuring every drop of liquid is extracted. Discard any solids that remain and store the liquid, refrigerated, in an airtight container.